Vortex Raptor 8.5x32 Review: Quality Porro Prism Binocular < $100! 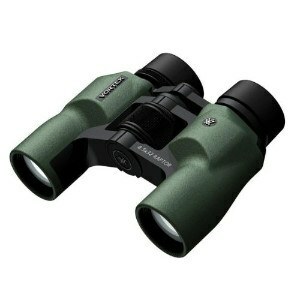 Home » Binoculars » Vortex Optics Raptor 8.5X32 Porro Prism Binoculars (R385) – Under $100! This Vortex Raptor 8.5X32 has the traditional porro prism assembly with a wide angle design that gives you a wide 390 feet field of view. It also has a wide IPD range, fully multi-coated lenses, and is fully waterproof and fog-proof. Online, this low budget binocular has a great rating and as the most budget-friendly Vortex binocular we have reviewed, it’s great to see ratings that reflect the high quality of even Vortex’s low budget options. With the many roof prism binoculars available in Vortex’s large selection, I had to throw in one of their select few porro prism binos and, this Raptor 8.5X32 smoked the rest in terms of ratings. Now, to get a full run down on this porro prism device, let’s answer any questions or concerns you might have about the Vortex low budget binocular. What is the IPD of this Raptor? IPD stands for Interpupillary Distance and this Raptor’s IPD is 50-70 mm wide. To use it, just open up the binoculars to the widest setting possible and then come down in range until it’s set for your eyes. You’ll know when you’ve got the right IPD because your image will be like looking through one round circle with no floating shapes or edge distortion. A common problem most users have with binoculars and IPD is it often isn’t narrow enough to cater to children or serious youth hunters. With a very narrow 50 mm IPD, this binocular will be the perfect device to gift your kid with or even keep for yourself this hunting season. Is this a roof prism binocular? No – this is a porro prism binocular. The zig zag design is a dead give away that it’s not a roof prism bino. You can see this because the eyepieces are offset from the objective lenses. Porro prisms used to be “the” most common prism design used, once upon a time. While roof prisms are quickly dominating the binocular market, porro prisms still have their place. And, they do have their optical advantages despite their larger and often heavier frame. Optically, an advantage is that porro prisms requires less light reflections in the prism assembly. This means, the less reflections it takes to get you an upright image, the less light will be lost during this process. This equals, more light for you and improved clarity and brightness. Also, because of the special prism setup, it doesn’t need special coatings to make it an optical champ like that of a roof prism binocular. All in all, porro prisms aren’t as bad as some optics companies are making them out to be. As long as you have superb glass, a great fit, and the perfect focus, you’ll fill your tag just as good as with a roof prism bino. How much does this binocular cost? If you didn’t know that Vortex has a low budget and entry level binocular, then this is it and now you know – you’re welcome. This 8.5X32 Raptor is only about $100 online, and the 6X32 is only a hand-span cheaper. It’s also right up there with the other affordable Vortex Vanquish binoculars. That series is also around $100, is lighter in weight, and more compact in design. It’s also a porro prism bino, of a sorts. It’s actually a reverse porro prism binocular where the objective lenses are closer together than the eyepieces. Although this isn’t my cup-of-tea design, you might like its sci-fi and clunky build. Is the Raptor tripod adaptable? None of the mid-size Vortex Raptors are tripod adaptable. And, with such low magnifications, 6X and 8X, you shouldn’t really need it. There is a 10X32, but unfortunately, that’s also not tripod adaptable. If this is important to you and you’re still trying to keep costs down, the Diamondback binoculars are in the next price range up and are tripod adaptable. To glass it up, the Vortex Raptor 8.5X32 binoculars are well worth their low cost. The build quality might not be as high as you’d expect, but for low budget, it’s going to perform way better than other optics in this price range. And it is for this very reason it earned a spot on our ‘Best Binoculars Under $100’ list – which you can see in full here. Really though, if you want something better, be prepared to spend twice as much. The Vortex Diamondback 10X42 (2016 model) is every hunter’s dream optic. It has an exceptional reviewer base online, and we think it’s priced far below what it’s worth. For only a few bucks more, you could check out the Nikon PROSTAFF 3S 8×42 binos. It’s different, since it’s a roof prism bino. It does have some extra glass perks, and all in all, it’s definitely worth checking out for a minute. Vortex does exceptionally well when they offer binos in the low budget price range. However, their quality often attracts those looking to spend in the mid to high-end range. Vortex does it all, and we think they do it pretty, darn well!